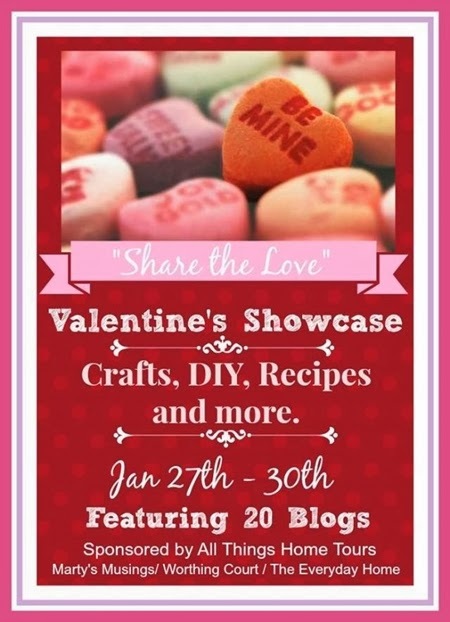 I’m excited to share this with you…my first ever Valentine mantel…and to join a group of twenty talented bloggers at the All Things Home Valentine Showcase! I love Valentine’s Day decor but have always had a fear of going overboard with it. But I think I have finally found a way to balance it…by adding a farmhouse look! My mantel is simple, using many of the same elements that I used for my farmhouse Christmas decor…galvanized lanterns, burlap, ironstone and rustic sweater knits. On the vintage mirror…my farmhouse Valentine wreath with sweater hearts! It was super easy to make and adds lots of texture to the mantel. You can get the tutorial here. On one side of the mantel…my rooster pitcher stand guard, adding a touch of farmhouse French to the look. It was a fun find from Marshall’s several years ago. …and used them in my farmhouse Christmas mantel. You can see more of my mantel here. On the other side, my kitty cat pitcher is filled with candles to add a little interest. It was also a Marshall’s find from several years ago. And of course, more ironstone in the form of plates on the mantelpiece…always there to add a little architectural interest. And there you have it…my farmhouse Valentine mantel! Need more Valentine inspiration? Here's a peek at my Valentine project gallery! Just click on the photos to be taken to the post with the full tutorial. And if you would like even more Valentine inspiration, please head on over to visit the other blogs on our tour! Thanks for stopping by! I hope you enjoyed seeing my farmhouse Valentine mantel! Please visit these wonderful bloggers and their beautiful blogs to see what they are up to and to find a list of this week’s participants! Debbie- that wreath is the sweetest! You hit the perfect balance with your mantel. Love it all, especially your lovely wreath! So pretty and perfect for Valentine's Day! I love those little sweater hearts. Adorable! Love the wreath and the wonderful bucket with the beautiful hearts…such a beautiful Valentine mantel! So sweet! LOVE the little sweater hearts in the galvanized container. Thanks for lots of inspiration. Debbie this is so pretty, love the wreath and those lanterns are gorgeous. The galvanized bucket is a keeper too. Debbie, your valentine mantel is darling. You've begun a new trend! The white rooster looks French. Is there a maker's mark? Happy Valentine's Day to you and your staff. So beautiful, Debbie! Love those amazing lanterns! Thanks for joining us on our tour! Love those sweater hearts. So cute! I really like that wreath! Hope you and the kitties are staying warm and safe! Such a lovely mantle display! I'm in love with the puffy heart wreath! Debbie, Thank you for some inspiration for a really pretty Valentine's Day mantle. I love the sweater hearts and the white rooster pitcher is so perfect with the red and white. I think I will add some red roosters to my mantle this weekend. I love your sweater hearts. Love EVERY one of your Valentine projects!! I found the same sweater hearts and made a wreath for my mirror in our foyer! So cool! Used wide white ribbon and it turned out beautifully! Love your blog! Thanks so much!